The Khatris and Aroras are mainly involved in trading. They are very much attached to their social and religious customs and traditions for most of the Sikh men living in Chandigarh wear their turbans. The other origin of the people living here includes Brahmans, Vaishas, Lohar, Gujjar, Tarkhan and Sansins. Some groups live in minority and they are Awans, Arians, Kalals, Ahluwalias, Labans, Nais,Sainis, Kambohs, Chimbas and Bhatiyas and Soods. Some of these castes have Arabian, Persian and Turkish heritage as well. The people of the Sikh community are featured by a well built appearance and they contribute to the major part of Chandigarh's agricultural output. They are all characterized by strong will power to earn a better way of life style. The people of Chandigarh are generally very warm and friendly and very loving towards their family. The ethnicity of the people of Punjab is featured by the broad range of human races which includes a number of families. The major ethnic group which occupies Chandigarh is the Sikh Jats who are noted for their well built physique and will power. Though due to several political and other external reasons in the past, there was a notable change in their racial feature. But today the different ethnic organizations live in the state with utmost cordiality and peace. As mentioned earlier though the Sikhs dominates the place there are also other major communities like Aroras and Khatris where the former claims its origin to the ancient Khatri clan, the latter has been derived from the famous Kshatriyas who used to belong to the Aryan civilization. But however there is a remarkable change in their pattern of life where people have made extreme progress in education. Chandigarh being predominantly occupied by the Sikhs, the most common languages spoken here are Punjabi and Hindi and so the traditions are also a mix of different religions. The people participate in all the religious activities and they don't restrict themselves to a single commitment. Though the people of Chandigarh belong to a cosmopolitan culture they are endowed with numerous temples, mosques, shrines and bhawans present throughout the city. The culture is a blend of Hinduism, Sikhism and Islam. 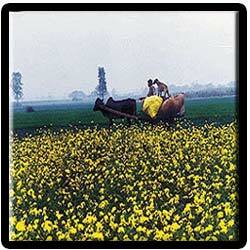 The people of Chandigarh celebrate festivals like Baisakhi commonly known as the harvest festival with great pomp. In the famous rock garden of Chandigarh the festival of Teej is celebrated which marks the rainy season and during this festival the women sing folk songs intoning the woman's separation from her beloved and also during this festival the women swing in the groves of trees. Lot of cultural and social performances pertaining to different community is held in the rock garden. The people of Chandigarh belonging to diverse culture and tradition, through bhavans and sabhas are involved in uplifting and promoting the ethnic value of their culture. The blend of the different cultural values of the people can also be seen in the varying architectural style of the shrines of this city. Chandigarh also has different places of worship belonging to other religions. The people of Chandigarh appreciate the folk music and dances of different communities. The culture of the Punjabis living here is very ancient and is rich of traditions. Every year in the month of February the people of Chandigarh never fail to celebrate the 'Rose Festival' during which varities of roses are kept in the Zakir rose garden. The festival is accompanied by performances of music and dance; both classical and folk, exhibitions by local artists, photographers and craftsman. During the Teej festival the women folk of the city sing and dance for the folk songs welcoming the monsoon season. This is actually conducted in the Rock garden where lot of stalls on women accessories like bangles, mehndi and other makeup utilities are kept in display. During the Mango festival the people of Chandigarh invite the Mango-growers from all over India to display their mangoes in the show. The people of Chandigarh very excitedly prepare jams, pickles and canned fruits and display it to taste and sale. Lohri is the most common festival celebrated by the people of Chandigarh and it signifies the harvest of Rabi crops. Once the harvest is complete the people clean up the place and lit bonfire and along with friends and family gather around the fire singing folk songs and throw sweets, puffed rice and popcorn into the flames as a part of their customs and traditions. During the day time on Lohri the children go from house to house singing songs in praise of Dulha Bhatti, a Punjabi version of Robin Hood who helped the poor by robbing from the rich. The bonfire is also accompanied by traditional dinner namely the makki-ki-roti.On this occassion people also give gifts and presents to their newly married daughters. The mix of tradition and welcoming innovations can be very much seen in the costumes of the people of Chandigarh. As in any cosmopolitan city the people of Chandigarh also follow modern outfits. However the traditional men's costume is the resplendent and sophisticated Sherwani which in the latest years is invested with Western-eastern fusion and is in keeping with the contemporary air and traditional choices. Otherwise the men of Chandigarh are seen with their normal outfit which includes long-sleeved shirt, with tie, coat and formal trousers for the office goers.T-shirts are also quite common. The costumes of the people looks very rich with the famous Zardozi work which is a kind of gorgeous Persian embroidery, decked with stones, gold and silver thread and present with copper wire, with gold sheen, or gold coloured thread and embroidery designs. The women living in the urban area of Chandigarh wear both Indian and western outfits. Their costumes mainly include salwar-kameez, sari, kurtis, jeans, shirts, T-shirts and formal/casual trousers. But however Salwar Kameez is all favourite costume of the women of Chandigarh. Though the rest of the country also has salwar kameez as their costume, the suits of this area differs by their extraordinary work like mirror and Kundan embroidery, Persian embroidery, Aari and Resham work. There are different other patterns of salwar suits which includes Cut-work salwar-kameez, golden filigree salwars-suits, vegetable dye kurta churidar, Phirozi salwars, handloom jacquard salwar suit, camric cotton salwar suit and chikan suit. The major occupation of the people of Chandigarh includes agriculture and its related industries. Though initially there were not many industries, now there are at least 580 factories in the city, including 15 large or medium scale units and 2100 small-scale units. This entirely boosted the economy of the people of Chandigargh.The major industries of the area comprises of food products, metal products, machine tools, electrical goods, transport equipment, pharmaceuticals, leather goods and plastic goods. However now the people of Chandigarh have come up with a new information technology park for the establishment of modern information technology based companies. Chandigarh is noted for it is the single capital of different states namely Punjab and Haryana. Designed by the French architect, Le Corbusier, Chandigarh is the first built planned city of the country. It takes the pride of being the internationally acclaimed city in India for its architecture. The city is divided into 47 sectors where each one is laid with market places and shopping centers. The most famous food of the people of Chandigarh is the Chole-bathure and of course the Punjabi food, arson-ka-saag served with blobs of white butter accompanied by makke-di-roti and lassi.The cuisine of the people of Chandigarh has more of dairy products in the form of malai, paneer and curds. There are different recipes of panneer like Kadai Paneer, and Makhani Paneer. Chandigarh and its adjoining states are very famous for lassi which is nothing but a sweet dish made of yogurt seasones with salt or sugar. They are sweet lovers and are known for the lip smacking Phirni, a sweet dish made of milk, rice flour and sugar and chilled in earthenware bowls. 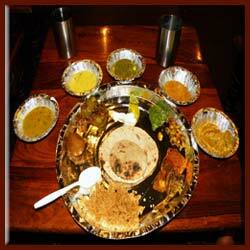 The tandoor-cooked food is also quite common in Chandigarh. When it comes to non-vegetarian chicken and fish are the most liked ones. The other popular dishes are mah ki dal, rajma and stuffed parathas. Nearly 80% of the total population is involved in agriculture and so the main occupation of the people here is agriculture. They cultivate paddy, oilseeds, wheat, coarse grains, groundnut, maize and pulses. They also grow fruits like guava, mango, banana, etc. and different varieties of vegetables. Chhattisgarh Thermal Power plants generate electricity on such levels that are quite sufficient in meeting the demands of the whole state. The mining industries which have come up in the state have provided with lot work for the labour class. Neerja Bhanot -Flight attendant and model. Jeev Milkha Singh -professional golfer. Kapil Dev -Former Indian international cricketer. Abhinav Bindra -Olympic gold medalist shooter. Mukesh Gautam -Punjabi film director.